1. Topfit mat is an attractive, custom fitting and easily cleaned protective all-weather mat. 2. The floor mats are also precisely designed using modern computer technology to ensure consistent quality and fit. So they are snugly fit. We offer four colors for your option. 3. Mats were elegant to look and feel. Installation was easy. There was no smell. It does not leave foot prints. Overall compliments already a great care for your model s.
4. Topfit floor mats protect a vehicle’s floor areas by keeping it free from spills, dirt and grime and are made from high quality leather, We makes durable floor mats and automotive accessories that protect and enhance your Tesla car. 5. Thanks to their superior waterproof qualities and rugged construction, our leather floor mats are a great option if you’re particularly concerned with spills and moisture tarnishing your factory carpets. 6. Topfit have been custom designed floor mats for the Model S and also for model X, will also design things for model 3. Note: This item can be shipped to customers with a U.S. or Canada address or a Euro address. Founded by a super Tesla fans and also Tesla owner, Topfit is a factory outlet created mainly to serve the Tesla community, by provide cool accessories and essentials for your amazing Tesla car. The boss of the factory is a super Tesla fan and science male designer, owned his model s at the date of August 2014, and had his model X 90D July 2016. Our team tested and improved every product again and again, trying to bring a better driving experience for Tesla owners. Looking for car floor mat for tesla model S? We have a fitting solution for you. 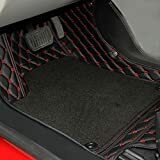 4 Fit floor mats protect a vehicle’s floor areas by trapping spills, dirt and grime and are made from a virtually indestructible rubber compound, We makes durable floor mats and automotive accessories that protect and enhance your Tesla car. Thanks to their superior waterproof qualities and rugged construction, Our leather floor mats are a great option if you’re particularly concerned with spills and moisture tarnishing your factory carpets. The floor mats are also precisely designed using modern computer technology to ensure consistent quality and fit. The New version with Grass Resistance to dirty, the color and material will not show the dirt. It makes The Tesla model S looks very great. There are four colors on offer for both two version, any Tesla owner can chose what color they love.